On Thursday night we’ll be treated (?) 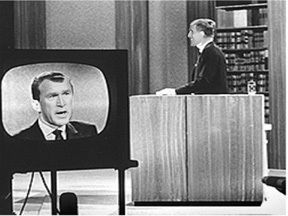 to the first of three presidential debates. At 9:oo p.m. E.T. on the campus of the University of Miami in Coral Gables, Florida, President George W. Bush and Senator John F. Kerry will square off to demonstrate their intellectual and rhetorical wares. Both sides agree that this debate, and the other two that follow, will be crucial to the outcome of the election. Yes, of course the spin machines are churning, but I doubt that they're in full force. This won’t happen until the debate gets going, and then, most of all, when it’s over. If you think they’re spinning now, you ain’t seen nothin’ yet. As a Major League pitcher puts spin on a curve ball to confuse a batter, so the verbal spinner twists the truth to keep the listener off-balance. Spin involves saying things that are true in some sense, but not speaking the full truth that ought to be spoken. It can lead to out-and-out lying, though it is usually more subtle and therefore potentially more pernicious. When we spin the facts we can excuse our lack of truthfulness or even congratulate ourselves on our cleverness (pp. 5-6). We may never see a clearer demonstration of spin than what goes on in the quadrennial presidential debates. One candidate rolls out an impressive list of “indisputable” facts upon which to base grandiose claims about his presidential qualifications. Then the other candidate presents an equally impressive collection of facts that contradicts everything the previous speaker just claimed. The first candidate then appears to commend his opponent while at the same time implying that he is a rank liar. Returning the favor, the second candidate lectures the first on the evils of making personal accusations and claims the moral high ground, while at the same time insinuating that his opponent is a lying scoundrel. And so it goes for ninety minutes. Now here’s a prediction worth betting on, don’t you think? Now just look what these guys started! A little different spin on reality. I’m sorry if I sound cynical about the debates. I’m not in the least cynical about the issues we face as a nation or the importance of this presidential race. But I do get tired of the endless, twisting spin. Though it might help to get somebody elected, I don’t believe it helps our country or the world. Yet, even if I’m cynical about the truth-quotient of presidential elections, I do not use this as an excuse for writing off political involvement. I still believe that truth-seeking and truth-speaking can make a difference, especially in local politics. Moreover, I passionately believe that the effort to speak and live truthfully brings rich, though sometimes costly rewards. That’s why I wrote Dare to Be True. So, there you have it, my debate predication along with a bit of ranting about the lack of truthfulness in presidential politics. Let’s see if I’m right. I have written quite extensively about the need for truthfulness in our world today. In Dare to Be True I deal with many of the practical challenges we all face in the effort to speak and live the truth. Moreover, I lay out a vision of truthful living that can motivate you to "dare" to be true. For more information about this book, or to order, click here. The first part of my sermon, "Filled with a Power Beyond Ourselves"
I’m sure many of my readers have heard the story. I first heard it in a sermon preached at my church by a guest preacher. No surprise, really, because it’s been a favorite of preachers for years. Most of them got it from e-mails sent by friends, though some, no doubt, lifted it from fellow preachers. It’s the touching story of little Teddy Stallard and Miss Thompson, his fifth grade teacher. I’ll summarize the story here, minus many of the heartwarming details. Teddy was the kind of kid who strained the mercy of a teacher. His messiness and unpleasantness quickly worked their magic on Miss Thompson, who just didn’t like the little brat. She even enjoyed giving him bad grades. But then Miss Thompson checked Teddy’s records, only to discover that he had been a fine student until his mother died of a terminal illness a couple of years earlier. Her shame was augmented when, at Christmas time, little Teddy gave her some perfume that used to belong to his mother. When Miss Thompson put it on, Teddy told her that she smelled just like his mother used to. Miss Thompson’s heart was forever changed toward Teddy. From that time onward, Miss Thompson invested countless hours in Teddy. Her devotion to him paid off as he began to turn his life around. Years later Miss Thompson received several letters from her former student, one when he graduated from high school near the top of his class, one when he graduated from college with honors, and one when he finished medical school and was about to get married. This letter was signed, Theodore F. Stallard, M.D. In all of these notes, Teddy credited Miss Thompson with changing his life by believing in him. What a great story! How inspiring! When I first heard it, I silently vowed once again to love the unlovely people in my life, no matter how much they bugged me. Several days later the story of Teddy and Miss Thompson was still haunting me, so I decided to do a little more research about it on the Internet. Guess what I found? There was no Teddy Stallard (or Stoddard, as he is sometimes called). And there was no Miss Thompson (or Mrs. Thompson, as she is often rendered). The whole story was made up, quite intentionally and obviously. It was a clever work of fiction by Elizabeth Ballard who published it in Home Life magazine in 1976 as a work of fiction. Now of course there’s nothing wrong with writing and reading moving works of fiction. And pastors can certainly use fictional stories in their preaching. Jesus, after all, told stories about people who never really existed (the Prodigal Son, the Good Samaritan, etc.). But there is a real problem, I believe, when preachers tell fictional stories as if they were true. If we do this, we might very well find ourselves like Dan Rather, short on the credibility that makes us effective in our jobs. 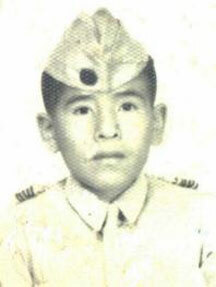 I found a Peruvian educational website that related the story of Teddy in Spanish. It included pictures of Teddy, both in his youth and at his wedding. How special! Teddy's a little hard to see in this picture. I figure he must be in the back, third from the right. Among his virtues, Dr. Stallard is humble and self-effacing. “Now, come on,” you might want to say, “does it really matter if a preacher tells a fictional story as if it were true, as long as he or she believes it to be true? After all, it isn’t a lie, but just a well-intended mistake.” Yes, I believe it does matter. In fact it matters more and more each day. Why? Because we live in a world where the people who are supposed to be careful about truth, people like Dan Rather or the accountants for Enron, are continually discovered to have passed on falsehoods, if not outright lies. People are increasingly reticent to trust so-called authorities, and who can blame them? Yet an effective preacher desperately needs the trust of the congregation. When I get up to preach, my people need to know that I have made every effort to be as truthful as I can be. The more my people learn that I am trustworthy, the more they will give me their trust. They will believe me, not only about illustrative stories but, more importantly, about the theological content of my sermons. Conversely, if people discover that I really haven’t done my homework when I pass on the latest e-mail tear-jerker, then they’ll be inclined to doubt the main points of my sermons as well. So what’s a preacher to do? I’d suggest that we ought to do what so many people have accused Dan Rather of not doing – carefully check our sources. “But,” you say, “this could be a huge research project. I don’t have time to do this.” I understand the problem of time, believe me. But often it takes less effort to check the validity of stories than you might think. The Internet, the source of so many fictions disguised as fact, also provides ways to do quick fact-checking. One of the most helpful websites of all in this regard is www.snopes.com. The folks at snopes.com have collected hundreds of so-called "urban legends," along with careful evaluations of the truth behind them. This material is organized according to category and it is also searchable. So, if you go to the search box at snopes.com and enter “Teddy,” you’re quickly sent to a list of entries, the top one having to do with little Teddy and Miss Thompson. But can’t a preacher tell iffy stories in such a way that doesn’t misrepresent their truthfulness. Suppose, for example, that I began the Teddy story with this opener: “The story has been passed around the Internet about a little boy named Teddy . . . .” Or maybe I could say, “I’ve heard this story recently, and it’s very moving. I’m not sure if it’s true, but I think it’s worth telling anyway.” These qualifiers are okay, but only if a preacher has made every effort to confirm or disconfirm the reliability of a story. Too many of these qualifying prefaces will protect the honesty of the preacher, but might undermine confidence in the preacher’s willingness to work hard when preparing sermons. Besides, many stories, like that of Teddy, depend for their power on the supposition that they are true. Now I know how frustrating it is to have a great illustration, only to discover it isn’t true. Some time ago a friend sent me a phenomenal story about violinist Itzhak Perlman, who almost miraculously played one of his concerts even though he broke a string right at the beginning. It was an excellent illustration of stewardship, and I was dying to use it. It bore all the marks of truthfulness, including a reference to the source, the Houston Chronicle. But, alas, there’s no credible evidence that the story in the paper actually happened. Yes, you can’t always trust the major media! I actually considered for a moment simply referring to the Chronicle and telling the story anyway. But I knew I couldn’t mislead my people. So I dropped the story, with considerable disappointment. Whatever I lost in that one sermon, and I certainly wasn’t able to find a better illustration, I gain by sticking with my policy to be a truthful as I possible can be in preaching. Over the years, my people have learned to put their trust in me, not because I never make mistakes, but because they know I have made every effort to tell the truth to the best of my ability. Trust is a precious commodity for a preacher, just like for a newscaster. It is costly and takes a long time to purchase. Yet it can be lost quickly. 1. Always check your sources as carefully as you can. 2. Never tell fictional stories as if they were factual. 3. When you’re not sure if a story is true or false, admit your uncertainty. 4. It’s always better to be safe than sorry. 5. Don’t use the Teddy story, even in Spanish. This post is the introduction to my sermon, "Hitting the Bull's Eye." I have no particular skill in archery. I learned how to do it when I was a kid at camp at Indian Village. (Yes, Forest Home had Indian Village way back then!) But that's about the whole of my experience as an archer: fifty arrows shot when I was around ten years old. Some of the arrows hit the target. Many went flying off into the woods. None, thank God, injured a human being, an animal, or even a tree. Mark Sides adds some interesting reflections on the issue of inclusiveness. 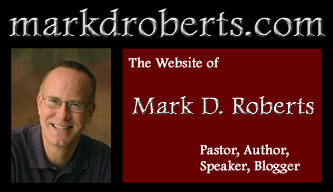 I recommend this post, not only because Mark likes what I've written, but because he builds upon it with fresh insight. Check out the rest of his website, while you're at it. Good stuff here! Fast forward 24 years to 1991. 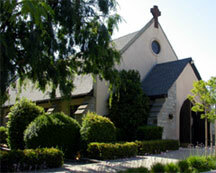 Now I'm the pastor of Irvine Presbyterian Church. I go up to Forest Home one hot summer day to visit the kids from my church at, you guessed it, Indian Village. As I'm wandering around during free time, I come upon the place where they teach archery. For a few moments I'm in a state of reverie, remembering my youthful attempts at hitting the target. 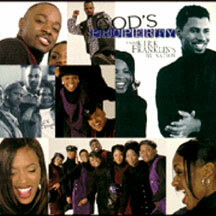 All of a sudden I'm jarred from my daydream by young voices yelling at me: "Pastor Mark, Pastor Mark, you try it. Pastor Mark, you shoot an arrow. You show us how it's done." At first I try to dodge the invitation. "Naw, that's okay. You show me." But the little Indians are insistent. "No, Pastor Mark. You do it. You show us." My resistance stiffens. Here I am, the new pastor of IPC, and I'm about to show the kids of the church what a klutz I am. I can hear it now, being passed all around camp, "You should've seen Pastor Mark. He completely missed the target. And then his arrow killed a squirrel. We don't like Pastor Mark anymore. He’s not nice." Yet the more I protest, the louder the kids become. "Pastor Mark, you do it. Just one arrow! C'mon, Pastor Mark. Show us how!" Finally I realize that I'm doomed. My coolness as the new pastor is just about to end. Klutzdom and infamy here I come. So I approach the archery area, picking up a bow and a single arrow. At least I’ll only have to embarrass myself once, I think. I place the arrow in it’s place and raise the bow to shooting position. As I’m holding it, I think to myself, “Just look at the target. Point at the target. 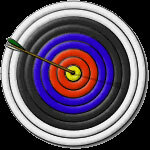 Focus on the target.” Following my own advice, I point my arrow toward the yellow center of the target. When it seems to be headed in the right direction, I let go with a silent prayer, Lord, may it hit the target! The arrow flies through the air. And then, bull’s eye! Not just close, but dead center. Right in the middle of the tiny yellow circle at the center of the target. I can’t believe it. Clearly a miracle. Indubitable proof of the existence of a gracious God. Of course the campers don’t know this is a miracle, and I’m not about to tell them. “Wow, Pastor Mark, you’re good.” “A lucky shot,” I tell them, trying to sound as if I could actually do it all afternoon. But then I hear the inevitable, “Do it again! Do it again!” Now my resolve is firm. “No, that’s enough. I don’t want to show off.” And so I’m done. And the kids tell the other kids about how Pastor Mark hit the bull’s eye on his first and only shot. And I swear never again to shoot another arrow. And, so far, I’ve kept my word, for thirteen years, and counting. There’s nothing quite like going out in glory. In Acts 1 Jesus is just about to go out in glory, a glory a whole lot better than mine, let me tell you. He's about to ascend to heaven in a brilliant cloud. But before he does, he gives a stunning instruction to his disciples: "But when the Holy Spirit has come upon you, you will receive power and will tell people about me everywhere-in Jerusalem, throughout Judea, in Samaria, and to the ends of the earth" (Acts 1:8). Jesus, I would suggest, gives his disciples a target, a clear target, a target with concentric circles for ministry, a target they should always keep in mind as his disciples. But, unlike in archery, the goal isn't to hit only the inner circle. In fact the point is to make sure that plenty of evangelistic arrows hit all of the circles, from the innermost to the outermost. For the continuation of thi sermon, click here. I must interrupt my regularly scheduled blogging (the series “Christian Inclusiveness”) for a special report. I’ll get back to the series tomorrow. I was able to see an advance screening of an outstanding television program that will begin airing on PBS this Wednesday night. The Question of God is a two-part series that focuses on the lives and thought of Sigmund Freud and C.S. Lewis. Hosted by Dr. Armand Nicholi, psychiatrist and Harvard professor, this program considers some of the deepest questions of life, including: Why believe in God? Where do we get our ideas of right and wrong? How do we understand and cope with suffering? What is the meaning of death? Part 1 airs on PBS, Wed, Sept 15, 9-11 p.m. Part 2 airs Wed, Sept 22, 9-11 p.m. 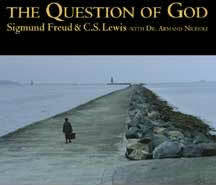 The Question of God is a gripping video presentation of the material in Nicholi’s book of the same title. The book is based on popular course he taught at Harvard College (after my time, I’m sad to say). Yet don’t expect to watch Dr. Nicholi lecture for four hours. The program comprises historical reenactments, round table conversations of key issues, and succinct narrations. Riveting visuals from the lives of Freud and Lewis complement the thought-provoking conversations. Nicholi’s genius is to put Freud and Lewis in dialogue with each other. Freud, of course, set much of the secular ideological agenda for 20th century thought, and Lewis spent much of his time responding to this agenda from a Christian point of view, arguing for the superiority of faith without rejecting the power of reason. Although we’re not in the 21st century, the dialogue between Freud and Lewis is absolutely on target in today’s world. I highly recommend this program. In fact, I’d recommend that you both watch it and record it. (If you miss it, you can order it online from PBS.) Part 1 of The Question of God airs on Wednesday, September 15, from 7:00–9:00 p.m. Part 2 airs on Wednesday, September 22, same times. Not only will you enjoy and be challenged by this program, but also you’ll find it to be a great conversation starter, both with Christians and with non-Christians. In fact, the producers of The Question of God have produced a useful discussion guide. You can download the guide from the PBS website. I can see this video plus guide as an outstanding discussion starter for church groups as well as for gatherings of people with diverse religious convictions. This program was not made for an exclusively Christian audience. It will engage believer and non-believer alike. But part of what I so appreciate about The Question of God is its effort to be truly fair to both sides of the religious-cultural-ideological debate. It’s rare to find such balance in the media, not to mention on PBS. 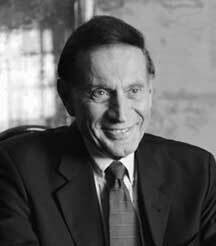 Armand Nicholi is a Christian, in addition to being an outstanding scholar and psychiatrist. Yet he doesn’t interject his personal faith into the conversation in a way that will turn off non-Christian viewers. I actually knew Dr. Nicholi when I was a student at Harvard. In fact our first interactions had peculiar consequences. In 1978 I was the leader of the undergraduate Christian fellowship at Harvard College. In this capacity I invited Dr. Nicholi to speak to our Friday night gathering on the issue of Freud and faith. He gladly assented. We widely publicized his upcoming lecture on campus. But on the Friday afternoon before he was to talk, I received a call from a very hoarse Armand Nicholi. “I’ve got to apologize,” he said, “but I’m so sick there’s no way I can make it tonight. We’ll have to reschedule.” So I had to be the one whole had to tell the huge crowd at the fellowship meeting that Dr. Nicholi wasn’t going to show up. And who was his replacement that night? Me. I told folks that I was going to fill in (on a different topic) and that they were free to leave. We took a five minute break. Most of the visitors left. But most of the fellowship regulars actually remained, much to my surprise. This was one of the very first times in life I spoke to a Christian group, something I’ve now done thousands of times. So, in an ironic way, Dr. Nicholi gave me my start as a speaker. Many thanks to Grace Hill Media for allowing me to view a screening of The Question of God. If you’re not familiar with this organization, you should check out their website. They’re doing great work. In yesterday’s post I began to confess my naïveté about things Episcopalian. I explained that most of my experience of Episcopal worship has taken place in weddings in which I have been a participant. Yesterday I described the first two of those weddings. Today I’ll chronicle the third. In this wedding I wasn’t a groomsman, but a co-pastor. The officiant was Father Rob, the soft-spoken minister of the bride. My job was to give the homily – which did not last 45 minutes, I promise – and help with the Eucharist. Father Rob had the responsibility of being the chief liturgist and helping me not to mess up too badly. He did both quite well. When I arrived an hour before the service, Father Rob asked what I planned to wear. I said that I had thought I’d wear my dark suit. He strongly suggested that I join him in wearing some sort of ecclesiastical garb. I consented. I figured, when in Rome, do as the Romans do. (Well, not exactly Rome, more like, when in Canterbury . . . .) Father Rob took me to his storehouse of priestly vestments. As a fairly low-church Presbyterian I was impressed. He owned all sorts of cassocks and surplices and albs and stoles. Father Rob planned to wear an exquisite embroidered chasuble (robe) with a golden stole. He offered similarly fancy vestments to me, but I just couldn’t see myself so dressed up. Eventually I chose a simple white alb. Everything went well in the wedding. My homily was short and to the point. Father Rob was a fine liturgist, both articulate and genuine. When it came time for the Eucharist, he officiated, and quietly helped me do my part, which involved serving the people who came to my half of the communion rail. Though I’d served communion before, I’d never done it in this way. There were a couple of surprises for me. First, some of those who received communion that day must have been traditional Roman Catholics, because they didn’t take the wafer by hand, but simply opened their mouths and expected me to put it in. Second, a few of the women at the wedding wore, how shall I say it in my G-rated website, dresses with rather low necklines. Their bowing presence at the communion rail threatened to distract my reverent heart. “Yikes! Lord, help me!” I silently prayed. I breathed a sigh of relief when the last communicants returned to their seats. I walked back to the table, where Father Rob told me that we had to consume everything that remained. I was surprised, because, though I knew Catholic priests did this, I didn’t think Episcopalians did too. But I’m usually a good sport about things ecumenical, so I ate the rest of the wafers, maybe twenty or so. Then came a most peculiar moment for me. In front of God and everybody, right in the middle of church, I drank a large goblet two-thirds filled with strong wine! Most Presbyterians aren’t offended at the thought of drinking wine, but we never do it in church. Communion for us almost always includes unfermented grape juice. And even if we were to have wine with communion, the quantity would be miniscule, and a deacon would dump out the excess. But in this Episcopal wedding I drank about eight ounces of wine. I wasn’t scandalized by this Eucharistic experience, just a bit perplexed, and maybe a tad amused as well. The strangest part of all was greeting the congregation after the service, still wearing my white “wedding dress,” and still smelling strongly of wine. I’m glad my teetotaling Methodist grandmother wasn’t there! The church where I helped perform the wedding. Episcopalians sure have some great looking churches. I came away from my third Episcopal wedding with these thoughts. First, those folks sure spend a lot of time in church. Second, they value aesthetics and beauty, including superb priestly vestments. Third, they use real wine in communion. I wondered if Episcopal parishioners ever get used to smelling alcohol on the breath of the priest as they leave the worship service. I don’t think I would ever get used to greeting the people smelling as if I’d just gargled with cooking sherry. Well, so there you have it, my Episcopal experience in a nutshell. Admittedly, there’s not too much of it, which is why my recent series on the Episcopal church might be naïve at points. But I’m learning more each day, for better or for worse. In the past three weeks I’ve been weighing in on the recent crisis in the Episcopal church. “Weighing in” is a good metaphor, because my posts have been rather heavy at times. But it’s the weekend again, so time for some lighter blogging. I’ve received many e-mail responses to my series “Lessons from a Church in Crisis.” Some e-mailers have assumed that I am an Episcopal priest. A few have even called me “Father Mark” or “Father Roberts.” Others have chided me for being ignorant of some feature of Episcopalianism. It’s well-deserved scolding, I might add, because I am rather ignorant of much that has to do with Episcopalianism, though I am learning quickly. Some correspondents have sent me to informative websites that approach Episcopalianism from a variety of perspectives (see the box to the right). These sites reflect a wide diversity of theological perspective. By linking to them I’m not necessarily recommending their content, some of which is great, some of which is not. I freely admit that I am a relative naïf when it comes to Episcopalianism. Though I’ve worshipped occasionally in Episcopalian churches, and though I have relatives who are faithful Episcopalians, my own knowledge and experience of the denomination have been rather limited. 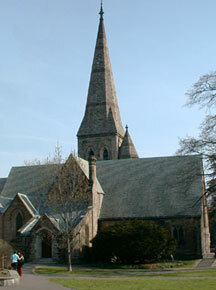 While in college I did worship for a couple of years in an Episcopal church, Christ Church of Cambridge, Massachusetts. 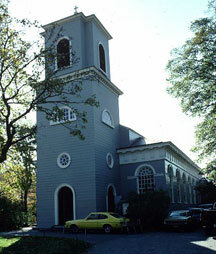 In fact the building in which I worshipped was the oldest church structure in town, built in 1761. Yet my congregation wasn’t Episcopalian, but rather an Assembly of God group that met in Christ Church on Sunday afternoon, so this hardly counts as in-depth exposure to Episcopalianism. My “inside experience” of American Episcopalianism has come from participating in Episcopal weddings. I’ve been in three to this point. Each one had its unique joys and, shall I say, its peculiar challenges. I was a groomsmen in the wedding of my college friends, Don and Laurie. They were married in the classically beautiful chapel of the Episcopal Divinity School in Cambridge, Mass. The wedding started perfectly enough, as the bride entered to the wistful strains of Pachelbel’s Canon in D played by a string quartet. As the rector began the service, his pace seemed a little slow, which worried me because I knew the wedding party would be standing for quite a while. Before long he got to his homily, which I expected to be fairly short, maybe ten minutes or so. But at the ten minute mark the rector was just warming up. Seemingly without any advance preparation, he was waxing eloquent about the theological meaning of marriage. By twenty minutes, with no end in sight, I became concerned. Plus, my legs began to ache from standing at attention for so long. At thirty minutes and counting I had visions of getting one of those long hooks and dragging the pastor away from the altar. Finally, at forty-five minutes he decided to stop and finish the service, which included a full Eucharist, of course. Several years later I found myself as the best man in another Episcopal wedding. This one took place in Claremont, California, in the middle of the summer. Now if you know anything about Claremont, you know it’s hotter than Hell there in the summer, even if you happen to be in an Episcopal church. Of course this particular church did not have air conditioning, so we all got to enjoy the heat. By the time the wedding began, it was about 90º in the sanctuary, probably 100º outside. I was wearing a dark brown tuxedo, 100 virgin polyester – no natural fibers, no breathing of the fabric. It could well have been one of those rubberized weight-loss suits. By the time I was standing at the altar alongside the groom, my body was drenched with sweat. This time, I’m glad to say, the preacher did a fine job, short and to the point. (But I must add that he wasn’t an Episcopalian, but a Presbyterian on loan for the day.) Nevertheless, with lots of liturgy and lots of music, the service still felt interminable in that sweltering sanctuary. The crowning moment was the singing of some esoteric Episcopal hymn. Now I’d sung hymns all of my life, but had never heard this one. Neither had 99% of the congregation, given their lackluster participation. This particular hymn – I can’t remember the name – had seven, count ‘em, seven verses. And the tune changed midstream. To make matters worse, the organist messed up, playing the wrong tune with the wrong verse. The groom standing next to me was gritting his teeth, literally, in disgust. Meanwhile, I just stood there at attention, feeling the drops of perspiration make their way from my head to my feet. I came away from my second Episcopal wedding with these thoughts. First, those folks sure spend a lot of time in church. Second, they value aesthetics and beauty, but need to have better musicians if they're going to sing such sophisticated hymns. Third, they use real wine in communion. If you can believe it, my third Episcopal wedding experience was even more peculiar. But I’ll save this for tomorrow’s post. 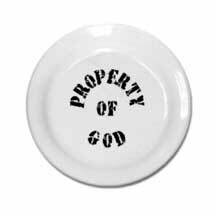 In my last two posts I’ve been commenting on God’s property, both pop-cultural and natural. Given our tendency to refer to scenic places as “God’s country,” it seems odd to me how rarely the names of such places actually acknowledge the Almighty. Nevertheless, I still can’t think of many natural features named after God. Ironically, the Devil does much better in this respect. Take my home state of California, for example. Two of our most prominent natural features are nominally the possession of Satan: Devil’s Postpile in the eastern Sierra and Mt. Diablo (Spanish for “devil”) outside of San Francisco. 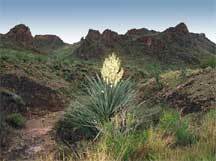 I’ve also visited Devil’s Crag (High Sierra), Devil’s Canyon (Angeles National Forest), Devil’s Backbone (a portion of Mt. Baldy), Devil’s Slide (near Idyllwild), Devil’s Hole (San Bernardino National Forest). I’ve yet to visit Devil’s Falls (near Sacramento), Devil’s Racetrack (in Death Valley), or Devil’s Golf Course (also Death Valley). You’ve got to wonder if Californians are a bit obsessed with the devil. Devil's Postpile in the Sierra of California. Basaltic lava cooled and cracked, making polygonal columns. 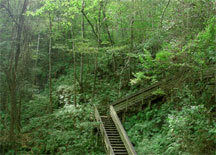 Outside of California I’ve only visited one of the devil’s sites: The Devil’s Millhopper near Gainesville, Florida. This is a 120-foot deep sinkhole filled with verdant plants and flowing streams that disappear mysteriously into the ground. Though we usually associate the devil with the fires of Hell, it’s actually much cooler down in his Millhopper than up on the surface. 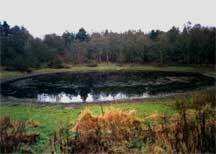 Besides this sinkhole, the devil has laid claim to a lake in Wisconsin, a rocky crack in Utah, a peak in South Africa, a cave in Germany (Teufelshöhle in German), an island off the coast of French Guiana, and several “dens,” including one in Yellowstone National Park and one in Arkansas. 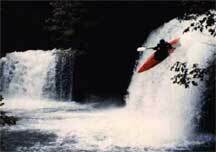 Speaking of Arkansas, there is a stretch of river named after the devil, including some stunning waterfalls. Throughout the world the devil has many “fingers” and “thumbs,” rock formations and mountains that jut up ominously. One of the most famous of these is just outside of Boulder, Colorado. It’s a particular favorite of rock climbers. I don't know how these falls were named, but it seems to me that the devil must have been the one who tempted this kayaker to go over them. Curiously, I found that the devil has more “punchbowls” than any other natural feature. I had known about one Devil’s Punchbowl in the San Gabriel Mountains near Los Angeles, but only recently discovered that there are Devil’s Punchbowls in Northern California, Oregon, Ontario (Canada) and Southern England. I can’t quite figure out why the devil needs so many punchbowls. Perhaps the excessive heat of Hell makes him thirsty. If I had to vote for one punchbowl that looks like it might really belong to the Devil, I'd go for the one in Southern England (above) rather than the ones in the High Sierra (right) or Southern California (far right). Why are so many natural features named after the devil? When a distinctive geological oddity is made of hardened lava that once flowed from Earth’s molten core, people are apt to name it in honor of the being who supposedly inhabits that hellish core. 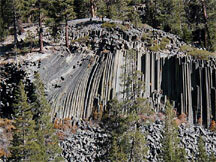 This is the case of for the Devil’s Postpile in California as well as the Devil’s Tower in Wyoming. 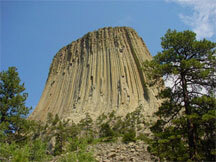 Devil's Tower (right) was made famous in Steven Spielberg's film Close Encounters of the Third Kind. Mt. Diablo in the morning fog. So, even when you find yourself out in God’s country, watch out for the devil’s stuff. He’s got plenty of it. In my last post I surveyed all of God’s stuff that I could find on the Internet. 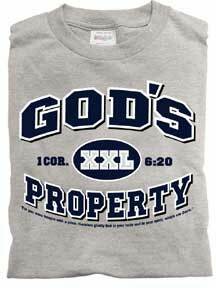 It turns out that God’s property includes t-shirts, sweatshirts, caps, visors, mugs, coasters, lunchboxes, Frisbees, Bible covers, briefcases, gospel albums, and even an unisex beauty salon in Brooklyn, New York. I must admit, though, that I overlooked the things I usually identify as belonging to God. I’m speaking of natural wonders, especially those that demonstrate the creative power of the Lord and reflect his all-surpassing beauty. I received a marvelous reminder of God’s true property this summer while visiting the Chapel of the Transfiguration in Grand Tetons National Park. The view from within the humble chapel, including the simple altar, was moving, to say the least. People often speak of their favorite natural spots as “God’s Country.” If you travel around the United States very much, you’ll discover that God has country in almost every state. 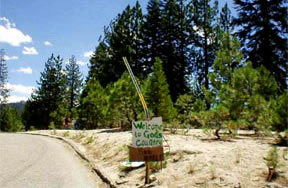 If you climb to the top of Kaiser Pass in the Sierra Nevada, California, for example, you’ll find a rough hewn sign proclaiming “Welcome to God’s Country.” Frankly, I’m inclined to agree with this characterization of one of my favorite places in the world. Of course people have varying ideas of what actually constitutes God’s country. I prefer majestic mountains. Others are satisfied with rolling hills. This is true of the residents of Hondo, Texas, a town of 8,000 people in the “hill country” outside of San Antonio. I’ve visited this part of Texas several times, and I agree that it’s quite beautiful. Though, as a Californian, I think “hill country” is a bit of an exaggeration. “Slightly bumpy country” would be more geologically accurate. Nevertheless, the city of Hondo is so convinced that they’re in the middle of God’s country that they erected a rather famous sign that proclaims it. 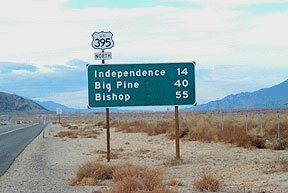 As you enter Hondo, you’re welcomed by a large road sign that reads: “Welcome. This is God’s Country. Please don’t drive through it like Hell. 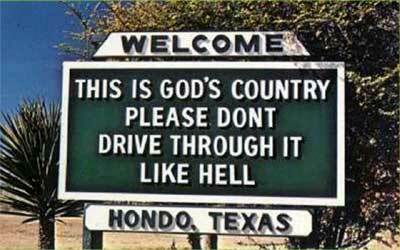 Hondo, Texas.” You’ve got to admire the thematic integrity of this sign, which contrasts God’s country with Hell. All of that and irony to boot! This sign was erected by the Hondo Lions Club in 1930. The Lions were trying to keep drivers from speeding dangerously through the town, so they sponsored a contest to come up with a slogan that would encourage more considerate driving. The “Don’t Drive Through It Like Hell” suggestion, initially a joke, won the contest. Whether Hondo, Texas is actually God’s country or not is a matter for debate. From my point of view, I wish the “hills” were a little more loftily inspiring. 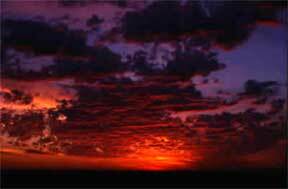 However, it’s hard to beat a Hondo, Texas sunset. Maybe this is God’s country after all. The juxtaposition of God’s country and Hell suggests a direction for further blogging, which I’ll pick up tomorrow. Sunset from a ranch outside of Hondo. God Sure Has Lots of Stuff! If you’ve been reading my blog for a while, you know that I tend to lighten up a bit on the weekends, especially after a week of heavy blogging. My hope is that I can amuse or inspire you – maybe both. I’ll get back to “Lessons from a Church in Crisis” next week. In the midst of my recent reflections on who owns church property, I thought I’d do an Internet search to see if I could learn anything interesting about what God owns. Indeed I did! What I learned is that God sure has lots of stuff! For example, God has staked his claim to all sorts of clothing. None of that angelic, flimsy, wispy stuff either. We’re talking serious t-shirts and sweatshirts, stuff you could wear for a heavy duty game of rugby. But God has much more than merely a line of clothing. It turns out he has mugs and coasters, Bible covers and briefcases, caps and visors. 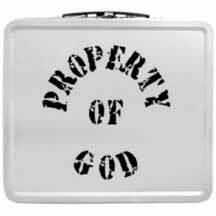 My favorites among God’s novelties are his lunchbox and his Frisbee. 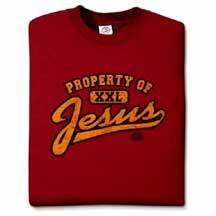 Some items are apparently owned, not by the whole triune God, but by individual members of the Trinity. 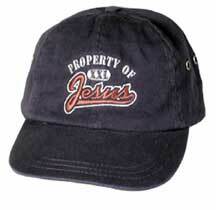 Jesus, it turns out, lays claim to his own line of fine apparel, including ball caps and sweatshirts. Apparently sometimes God is not willing to share his property with others. This is further evidence for the fact that the Almighty never went to kindergarten, where sharing is a prime virtue. Consider the case of the New Hope Church in Henning, Tennessee. 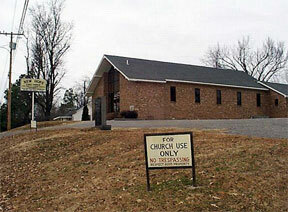 The sign out front, which is hard to read in the picture, says: “FOR CHURCH USE ONLY. NO TRESPASSING. RESPECT GOD’S PROPERTY.” So if you were thinking of having a picnic on God’s grass out in front of the New Hope Church, you can just forget about it. But the most surprising discovery I made about God’s personal possessions is that the Almighty owns a beauty salon in Brooklyn, New York. It’s called, appropriately enough, God’s Property: E.A.B. Unisex Beauty Salon. If you look closely, you can even see two pair of praying hands adorning the sign of the salon. I must admit that I’m wondering about the theological implications of a unisex beauty salon, however. I never before knew that Galatians 3:28, “neither male nor female,” applied to haircuts. So, as I said, God’s sure has lots of stuff. Tomorrow I’ll comment (a tad less tongue in cheek) about some of his most stunning possessions.